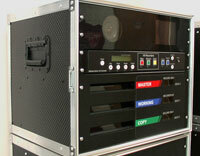 The Black Diamond Series 107 DVD interview system is our second generation DVD interview system. It still uses our separate hardware designed controller that has the skilled operator inbuilt. The controller provides the user interface, adds the analogue time/date, provides the user prompts and warning messages, has several analogue inputs/outputs for external microphones, internal microphones, camera(s), monitor outputs and UHF TV R.F. outputs (A legacy option that we still support), playback sound system and speakers. The Standard Series 107 system has the optional ability store up to 800 standard length interviews or to simply erase the interview once they have been successfully transferred to DVD. The Black Diamond Series 107 Interview systems can record for several hours without interrupting critical moments in the interview to change DVDs because they have reached their 2 hours record limit. The design like all previous designs has been future proofed allowing for cost effective future upgrades as standards and technology evolves. The series 107 interview units operate for 110 VAC ~ 240VAC input. They operate internally from 12VDC. Complete overt interview system with 3 full size DVD burners and a full body camera to ensure the greatest integrity of evidence being collected. Fixed station systems are designed to be set up in purpose built interview rooms. This system is designed to work covertly in situations that require sensitivity such as interviews with children and witnesses. Complete with camera and microphone which are mounted in the interview room and the recording equipment set up in the monitor room. The internal 7” LCD monitor is replaced with a larger external LCD monitor. This system is an ultra-light weight portable system using notebook burners and has a total weight of under 4kgs. The robust design of the Black Diamond interview systems ensures it travels well and lasts the distance. This model can be used for both covert and overt interviews. This system shares the same chassis as the larger station recorders.